In a National Science Foundation-funded study presented at the American Astronomical Society national conference in Atlanta, the team says the star is at least as bright as the Pistol Star, the current record holder, so named for the pistol-shaped nebula surrounding it. Whereas the Pistol Star is between 5 million and 6 million times as bright as the sun, however, the new contender, LBV 1806-20, could be as much as 40 million times the sun's brightness. Astronomers have known about LBV 1806-20 since the 1990s. 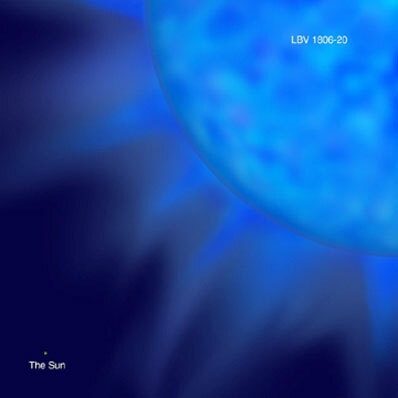 At that time, it was identified as a "luminous blue variable star" - a relatively rare, massive and short-lived star. Such stars get their names from their propensity to display light and color variability in the infrared spectrum. "The shimmering that you see coming off a hot blacktop road in the summer - the upper atmosphere kind of does that with star light," Eikenberry said. "Speckle imaging kind of freezes that motion out, and you get much better images." Each of these variables contributed to the estimate of the star's remarkable candlepower. "You correct for dust absorption, then you correct for temperature of the star, you correct for distance of the star - all of those things feed into luminosity," Eikenberry said.